It’s hard to find out how a company actually pays employees for specific jobs. Or should I say it used to seem impossible but there is a site that can help you gauge this information. 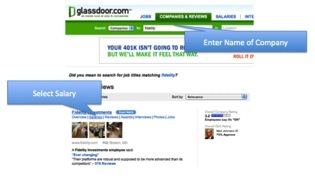 Glassdoor.com is a free site that requires you to submit some information in order to gain amazing inside knowledge from current and previous employees. It’s all done anonymously which may cause some misinformation but it’s more knowledge regarding salaries than we previously had. Let’s see how you can use this information. 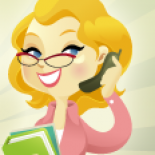 For this example, Fidelity is the company that has offered you a marketing manager position. The first thing to do is to find Fidelity on GlassDoor.com. 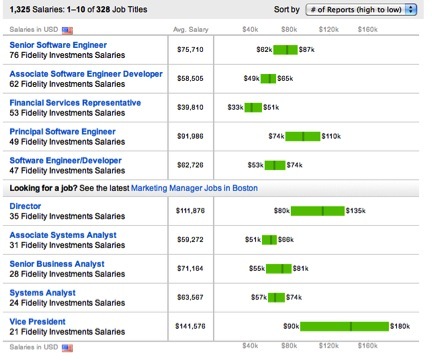 There is salary information for more than 300 job titles. Let’s narrow the search to marketing job titles within Fidelity. 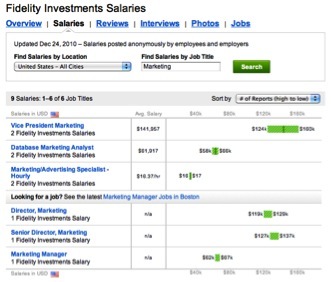 Now you can see that one person who has been a marketing manager for Fidelity provide their salary at $62K – $67K. That’s a bit under the average we found for Marketing Manager’s in Salary.com in the last post. That average was $97K. We also see that two people have posted their VP of Marketing salaries and there is a wide range, $124K to $160K. It’s good to know that people with the same titles are making as much as 23% difference in salary. Could the marketing manager who accepted the $67K salary have gotten closer to the $97K median determined by Salary.com? Probably. Let’s see how you may investigate this more. Now go back to view all the 300+ job titles but sort by number of reports so you can see the spread of salaries within one title. They are fairly big spreads. The Senior Software Developer who is earning $62K would get a 40% raise to catch up with the Senior Software Developer who is earning $87K. The Principle Software Engineer who make $74K would need a 48% raise to earn the same $110K that another Principle Software Engineer is making. A Director who earns the low end of $80K would need a 68% raise to earn $135K which other Directors are earning. The VP who earns $90K needs a 100% raise to make what other VPs are making at $180. Based on this data, I would feel very comfortable countering a job offer with a 50% increase in salary. And if I had more data, it could go higher. I hope this example shows you how to take 10 minutes before you accept your next job offer and see how many thousands of dollars you may be losing if you don’t negotiate your salary. First-class news it is without doubt. Friend on mine has been searching for this tips. If you want to check your future employer’s background properly, you should take a look at http://www.jobreviewusa.info You’ll find there thousands of companies reviewed by employees. This entry was posted on March 17, 2011 by Katie Donovan in Company Research, Equal Pay, Women Negotiating and tagged company salaries, corporate compensaion, corporate salaries, salary research.